I love National Days. Have you ever heard of them? Basically, it's a holiday for something kind of random. And today is one of those days. Today is National Toast Day! Yes. We have a holiday dedicated to toast. It actually started in the UK in 2014 by the Tiptree World Bread Awards, which sounds awesome in itself. The US seemed to like the idea to celebrate the versatile magic food, so grab your jam and lets celebrate! 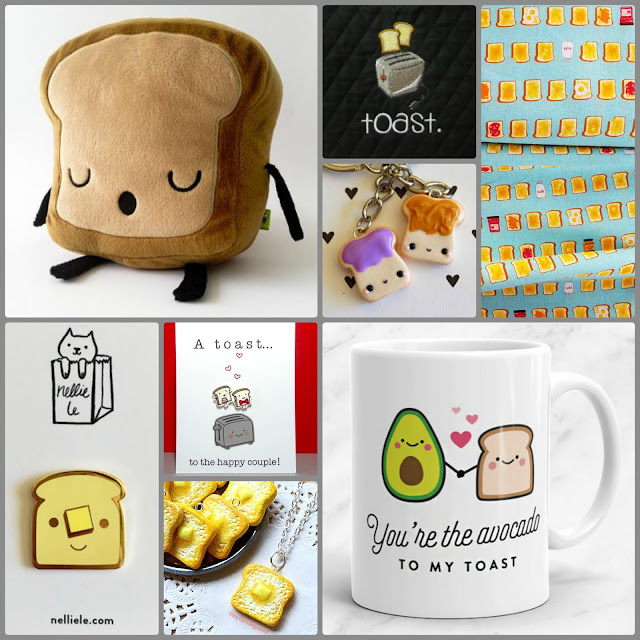 I've put together a collection of toast related goodies that I found all over the interwebs. It would seem that everyone loves toast, because I found some pretty amazing things! Did you know there was a Toast game? Yeah, me either. But my cats definitely need that bread bed. And who doesn't want to toast their hands with smiling hand warmers? Toast is so versatile! Did you know you can put almost anything on toast? I didn't think about half of these recipes. I'm pretty pumped to eat all the toast now though. What's your favorite toast related thing? Interested in more National Days? Check out the National Day Calendar and schedule yourself a year of celebrations! Some of these are hilarious! I don't have a cat but, maybe my dog needs a bread bed. I do love bread so cheers to National Toast day! This is such a fun post! Can I toast to this post?! My cat would just love that toast bed. So cozy and that avocado/toast coffee mug makes me smile! A toast to bread cat beds! Well, there goes my whole savings account, all spent on cute little toast products!! haha! LOL...this is great. I love the avocado/toast mug! I need that! I had no idea there was a national toast day, but I think it's great that there is one! It's one of my favorite breakfast foods! This was a great post, who knew how versatile toast could be. I like the energy boosting toast ideas. omg I can't get over all the cute little toasts! This post had me laughing. Happy National Toast Day, Love it!!! I see cuteness all around me! I wish we had that sandwich pillow for our cat. Here's a "toast" to this wonderful day, cheers! This is my first time to hear celebration about toast. LOL!! That is pretty cool and those toast pillow are so adorable. I really like one. LOL!!! YUM! I love toast and you have some delicious options listed out here. I am going to try some of them out. OMG, you just gave me an excuse to eat all the bread! Love it, cinnamon toast and french toast are 2 of my favorite foods, so I'll be heading to the kitchen now!